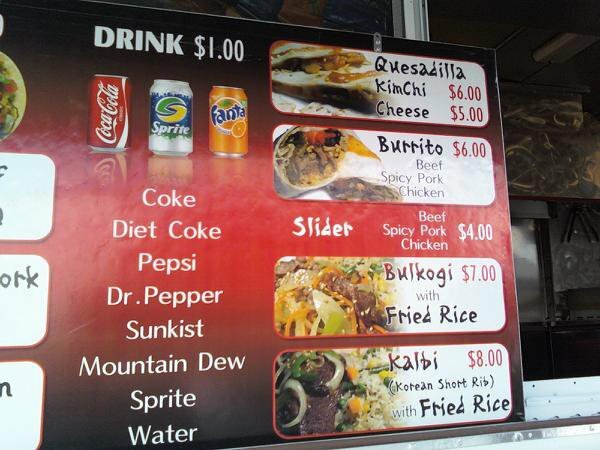 Hidden Treasures: Bulkogi Korean BBQ at the State Flea Market | RDU Gonna Eat That? Typically, the food at the Flea Market is of the fried dough variety. For the most part, if it’s not deep-fried, coating in sugar, or on a stick, it’s not a meal. 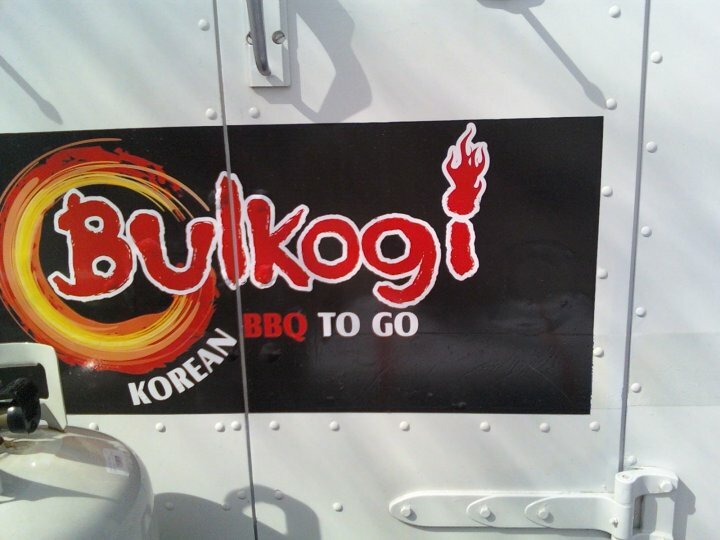 So, Bulkogi Korean BBQ is a breath of fresh air. They’re a chain of food carts that offer a spin on Korean food by mixing it with Mexican street food. The menu has some interesting items, BBQ pork or beef tacos, bulgogi (a marinated Korean beef dish), bulgogi-topped hotdogs, and kimchi quesadillas. Tony loves kimchi, whose mystique had somehow eluded me. 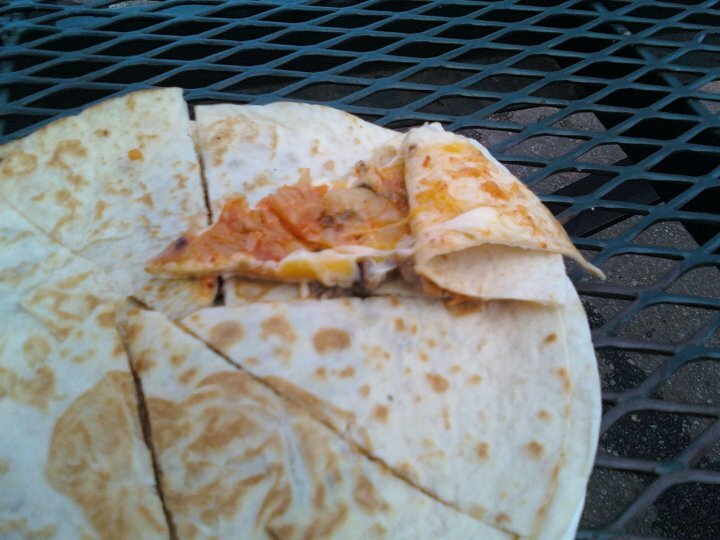 However, I think for the cabbage-phobic, the kimchi quesadilla is a good introduction. The kimchi in Tony’s quesadilla was both spicy and tart and made what was a traditional beef and cheese quesadilla really stand out. 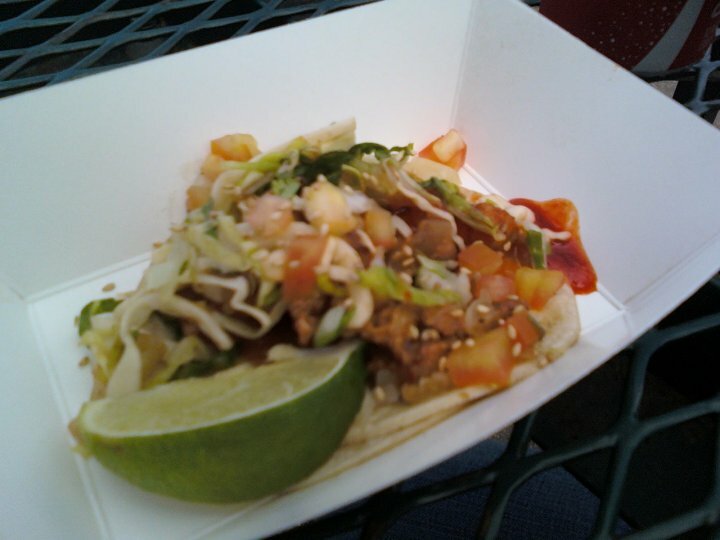 Meanwhile, my BBQ pork tacos were a perfect mix of Korean and Mexican cuisine. The tacos came with lime, a cool cabbage slaw, and sriracha sauce. It was a lot of heat, but the pleasurable kind you can still feel on your lips after. Plus, the meat in both of our meals was grilled to perfection, which was a nice surprise for meals that came out of truck. Overall, our meals were cheap ($2 for 2 BBQ tacos, $6 for the kimchee quesadilla), filling, and a real treat for the tastebuds. You never know what you can find at a flea market, and this was a true diamond in the rough. This entry was posted in Asian food, BBQ, food, Food blog, Kimchi, Korean, Pork, Raleigh, Raleigh food and tagged Asian food, food, Food blog, Kimchi, Korean, North Carolina, Raleigh, Tacos. Bookmark the permalink.